Sometimes it just doesn’t pay to be first. 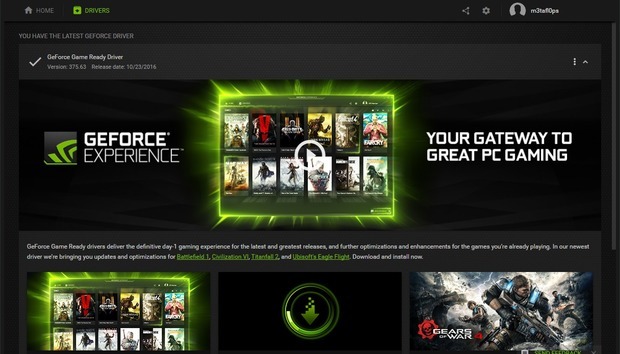 Excited PC gamers found that out over the weekend when they downloaded the GeForce 375.57 driver. Nvidia’s new driver was meant to make systems game ready for Battlefield 1, Civilization 6, and the release of Titanfall 2 coming up on Friday. If you see game ready driver 375.57 in GFE, don’t install it. What gamers received instead was a bundle of headaches. Taking to the Nvidia subreddit, Windows 10 gamers complained of 375.57 causing select Windows Store apps to crash, the inability to drag and drop Start menu tiles without their system freaking out, and image artifacts in GIFs and videos. To its credit, Nvidia (mostly) pulled driver 375.57 and rolled out a newer one—version 375.63—relatively quickly. This new driver appears to function just fine and doesn’t contain the same problems as its predecessor. That blue line is supposed to be a Calendar app tile. The impact on you at home: Unfortunately, Nvidia users may still be vulnerable to getting the bad driver update. I saw a GeForce Experience notification for driver version 375.57 this weekend but didn’t have time to install it. Then, on Monday morning, when I opened up GFE it was still offering to download and install the bad version—375.57. Of course, I had to install the bad drivers to see what all the fuss was about. I didn’t see any problems with opening Windows Store apps, but my Start Menu didn’t play nicely with tiles as you can see in the image at right. (I had to add some as I don’t use tiles.) I also witnessed artifacts in animated GIFs, but not videos. It’s possible I was offered the bad drivers because changes to Nvidia’s update servers haven’t propagated worldwide yet. Regardless, if your version of GFE is offering to install 375.57 don’t do it. Instead, get the newer driver directly from Nvidia’s website. While bad updates for graphics card drivers and assorted software are annoying, they’re also not unheard of. In March, Nvidia released a game-ready driver for The Division that caused some systems to go BSOD. Then in July, the GeForce GTX 1080 and GTX 1070 experienced some driver-related growing pains. Team Red has had its fair share of problems too. Last December, a Radeon Software Crimson update forced some AMD graphics cards to lock their fans to a maximum 20 percent speed limit, causing some systems to overheat. More recently, during the July 4th weekend, AMD engineers had to work overtime on a hotfix for a bug that could cause AMD cards to pull too much power from the motherboard.